In my continuing schedule of conventions during the spring/summer season (it's super packed, but yanno, I'm okay with that. I've missed doing the con circuit all winter! ), I actually visited a convention for once! This time around it was ANIME ST. LOUIS. This con was entirely new to me, and frankly the furthest west I've gone for a show just yet. 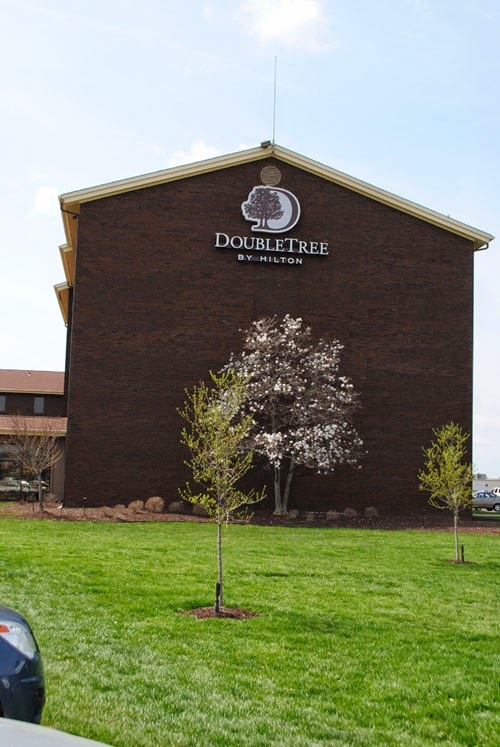 This little show took place at this lovely mini-convention center area, featuring a wonderful DoubleTree hotel! And I got my free cookie at check in! The rooms were fantastic, the beds were AH-MAY-ZING and the staff was awesome! They were even getting into the convention spirit and were wearing all the geeky stuff they could. :) They put up with all the congoers very well (and I might add I VERY much enjoyed getting breakfast buffet discount coupons. SUCH A GOOD OMELETTE). 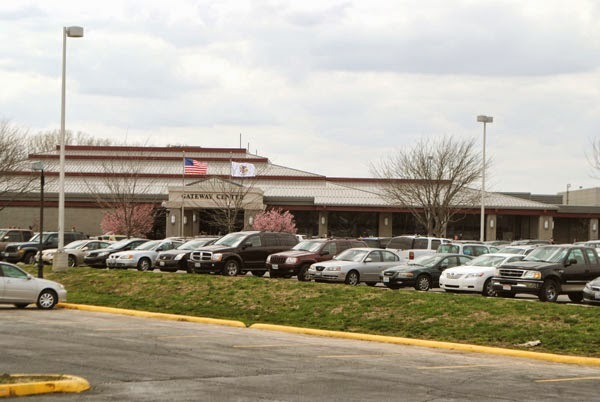 The actual show took place over in this little convention hall called the "Gateway Center". Don't be fooled, it's bigger on the inside! The center reminded me of a small convention hall we've got out by here in my area, except everything was better. The hall was pretty, lots of good rooms and locations. We had arrived Friday afternoon morning (we forgot there was an hour we gained from the new time zone), and things felt kind of slow. Apparently it didn't open until 3 in the afternoon, which worked out for us because I had some costume judging to be done that time anyway! I like a busy con! Dave and I were trying to go to panels, but the tiredness got to us and we just crashed out after going to one very informative panel "Dyeing for Cosplay". I am now confident that I TOO can dye things in my washer. I've got plans to try this out sometime later this year. Mwahahahahaha! Now, Saturday came around, and it started off with a lovely photoshoot in our WCS costumes, and the photographer was very good to work with. After, I went back and changed again into Emmet (he was the only one I could wear easily lacking my shoes). The hall was PACKED. Which honestly, I'm okay with it as long as the crowd is good too. Let me tell you, the vibe here was different than other cons I've been to locally. While we did have the occasional over-exuberant con goer, everybody was just really... chill. All staff was super helpful, the congoers relatively polite and courteous, and everybody just seemed to like being there. Honestly, it was super refreshing. There were little/no dance parties in the hallway, everybody was busy doing something (the schedule was fantastic). For an old-school curmudgeon like myself, it was a nice change of pace. The schedule was mostly filled with either informative tutorial type panels, fandom "discussions" and the like. 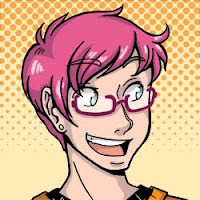 Not a "Meet X Character" panel to be seen. (I apologize for those of you who like those types of panels, they're not my bag, and they're kind of new to the old convention goers. I just don't get em, so I won't go to them, but I do dislike when they take up 50% of the con schedule). Even the convention hall staff was into the show! 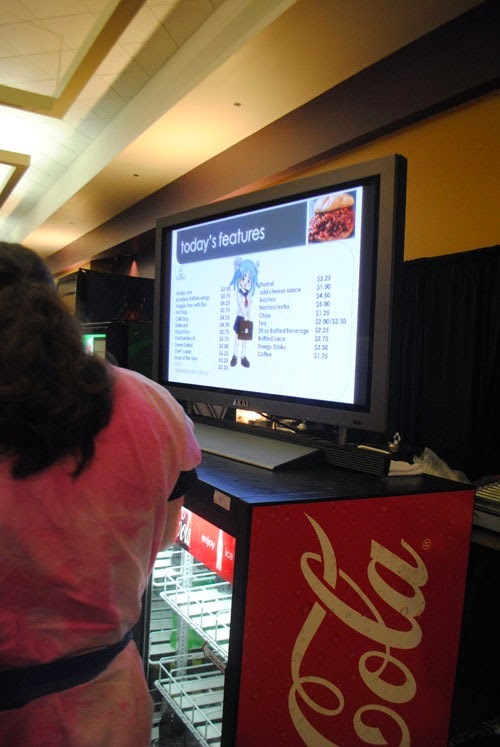 One of the best things they had was an actual concession stand in the hall - with decently priced items. I survived off their water bottles, dr. pepper, and FANTASTIC pretzels. Dave and I wandered the dealer hall and artists alley, and they were nice and pretty well stocked. 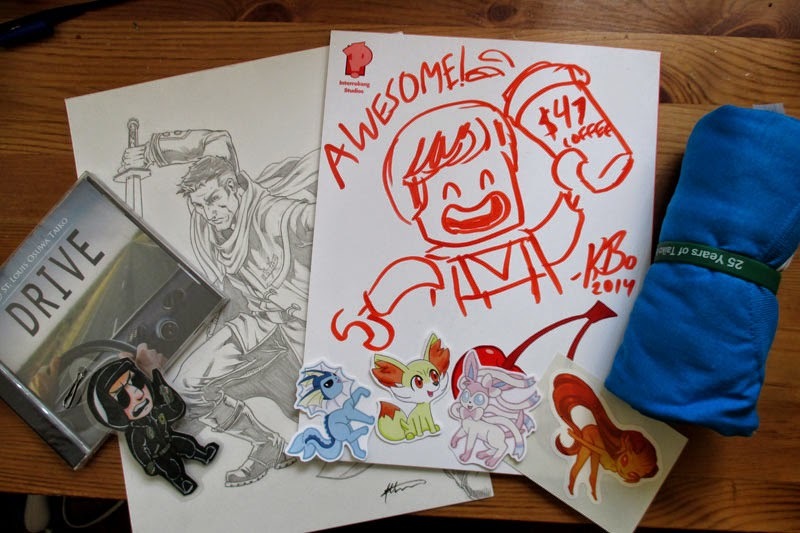 I got to talk to a lot of neat artists, got a commission, purchased an art book from a really cool guy, and got some fun stickers and things. Midafternoon rolled around and Dave and I decided we'd want to see the Masquerade (since I wasn't in it, and it wasn't too hard to get in - as well as knowing at least one person who was in it). The masquerade was.... interesting. 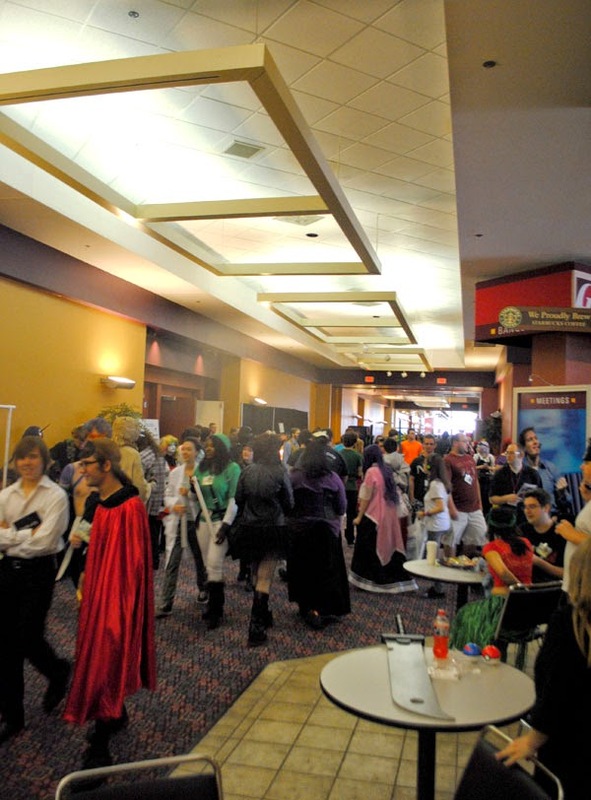 I say interesting more in the fact that it wasn't a typical Anime Con masquerade. It definitely felt a lot more like the old Sci-fi/Fantasy/ComicCon masqs rather than what is usually found for a cosplay competition at Anime Conventions. There were some unique things, some good things, and some... well, confusing things. I had to cut out early as there was a meeting for a dinner, but I think my nerves were catching up with me, and I had to bow out. It did, however, give me a chance to see their Taiko Drum concert. Which, I love Taiko. I usually only get to see it done in person when I'm at Disney World, so the chance to see it on a stage really close was a great opportunity. 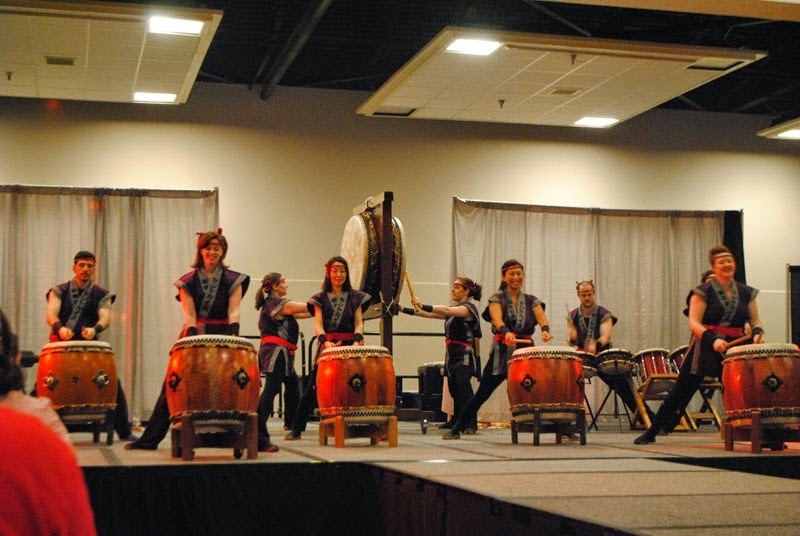 Turns out St. Louis actually has a local chapter of Taiko drummers (I'm so jelly! ), and their songs were great. They looked like they were having so much fun! It's like drumming, and dancing, and performing, and it looks FUN! What was even cooooler was that after the show, they had a "workshop hour" where they let us come up in groups and actually learn to play a taiko drum. 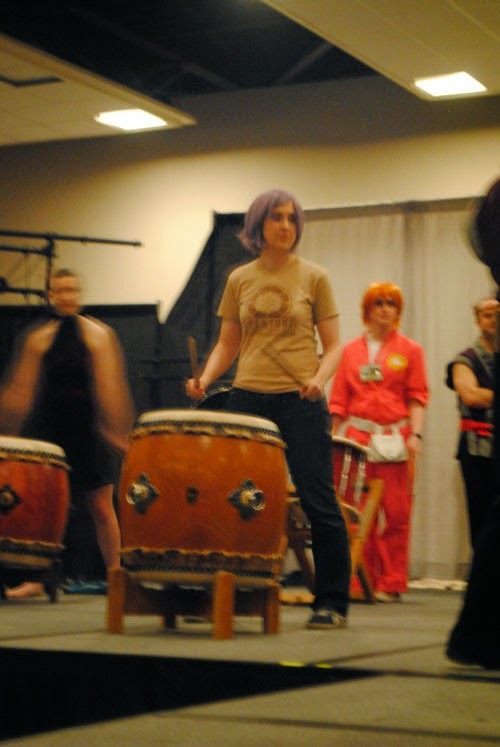 The picture's a little blurry, but don't mind that, I got to actually DRUM. It was a hoot, and I was a little sad cause we don't have a cool group like this out by us. That's right, they let me near it! Afterwards, we had the "backdrop set up" time for WCS, which didn't take too long, and then we crashed out. Sunday was WCS day, so we got up, got dressed and headed to tech rehearsal. Which I will brag right now, the stage staff they had for this show was the BEST and I was sad to leave them behind. Never had I seen a crew so on target. They even ran with the punches of our paper streamers and random stuff on the stage and got it all backstage for us to get. I cannot simply gush enough about how awesome all the stage ninjas were. 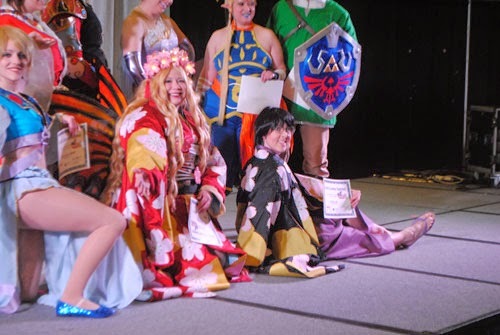 Speaking of WCS, in case you hadn't seen yet, the team I'm on (Karmaluna) took first at the preliminaries! All the flowers on those two kimono are all appliqued (heat-n-bonded) down and then outlined with about a 0.25" satin stitch of gold and metallic threads. This is why you guys didn't hear from me for a while. My kimono (the black one) goes down past my feet and about 9" onto the floor and is extra wide like a cape. OMG NEVER DOING THAT AGAIN. ...but they do look pretty. We chose to stay through Sunday, as it's like a 9 hour drive for us to get back home. After striking the set, we basically chilled in the room and I played Pokemon and stared at my sketchbook. Which was AWESOME because I hadn't done that in FOREVER. The route back was a change up for us - we had wanted to do some sightseeing that day, but apparently Canada got Lonely and decided to hit the Midwest again with 35-ish temps (F). So instead of getting to go to the park, we drove and I took pics out our window of the car. I can say with assurance I have OFFICIALLY seen the western half of the US. 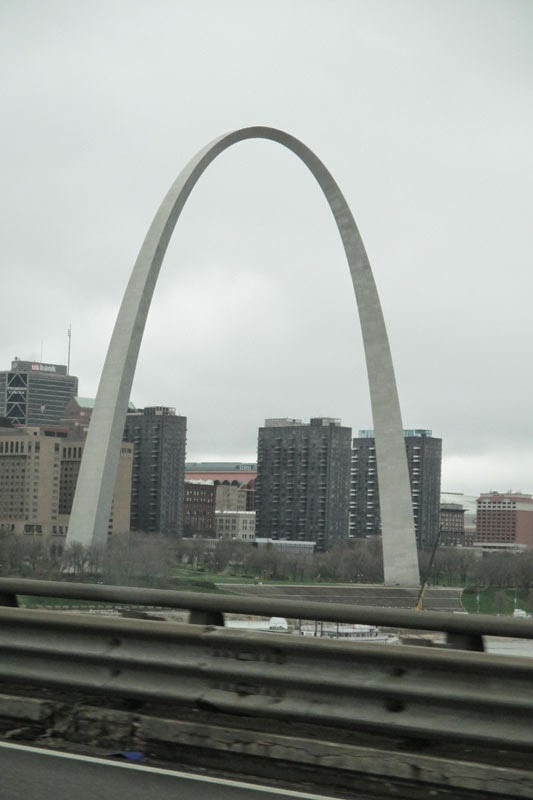 Okay, so we were in a car and made a loop across the Mississippi, and I saw the St. Louis Arch, IT STILL COUNTS OKAY. Maybe next time it'll be nicer on Monday and we can take our time. We took another path home - and drove up through Chicago. We stopped at Portillo's for some AMAZING hot dogs, and made it home that evening. 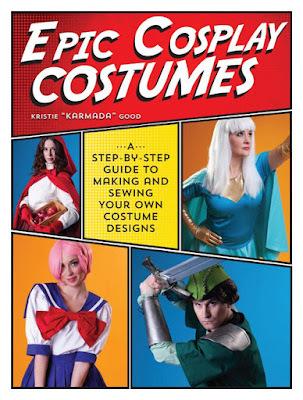 To which I then started to plan the next con appearance. Coming up next is Midwest Media Expo, and if I get the chance between now and then I'll do a collective Cosplay post for the last two shows, so I'm all caught up. Now to attack those cosplay photos of myself! WHEW.